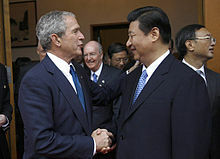 Xi Jinping (/ˈʃiː dʒ��nˈpɪŋ/; Chinese: 习近平; Mandarin pronunciation: [ɕǐ tɕîn.pʰǐŋ]; born 15 June 1953) is a Chinese politician serving as general secretary of the Communist Party of China (CPC), President of the People's Republic of China (PRC), and chairman of the Central Military Commission (CMC). Often described as China's "paramount leader" since 2012, he officially received the title of "core leader" from the CPC in 2016. As general secretary, Xi holds an ex-officio seat on the Politburo Standing Committee of the Communist Party of China, China's top decision-making body. A slick tool for teaching “Xi Jinping Thought” has become the most popular smartphone app in China, as the country’s ruling Communist Party launched a new campaign that calls on its cadres to immerse themselves in the political doctrine every day. Xuexi Qiangguo, which translates to “Study powerful country”, is now the most downloaded item on Apple���s domestic App Store, surpassing in demand social media apps such as WeChat and TikTok – known as Weixin and Douyin, respectively, in mainland China. ^ Liu Yandong, Wang Qishan, and Deng Pufang (Deng Xiaoping's son) all placed among the bottom of the alternate member list. Like Xi, all three were seen as "princelings". 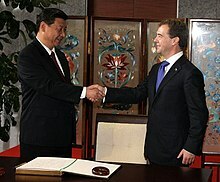 Bo Xilai was not elected to the Central Committee at all; that is, Bo placed lower in the vote count than Xi. ^ "Implications for Africa from China's One Belt One Road Strategy". Africa Center. 22 March 2019. Retrieved 11 April 2019. ^ Meng, Chuan (4 November 2014). 习近平军中"亮剑" 新古田会议一箭���雕 [Xi Jinping And Central Army's New "Bright Sword" Conferrence In Gutian Killed Many Birds With Only A Single Stone]. Duowei News (in Chinese). ^ Jiao, Wu; et al. (8 September 2013). "Xi proposes a 'new Silk Road' with Central Asia". Chinadaily USA. Retrieved 29 October 2018.